Add innovation and imagination to food presentation with our vast collection of presentation and display solutions. 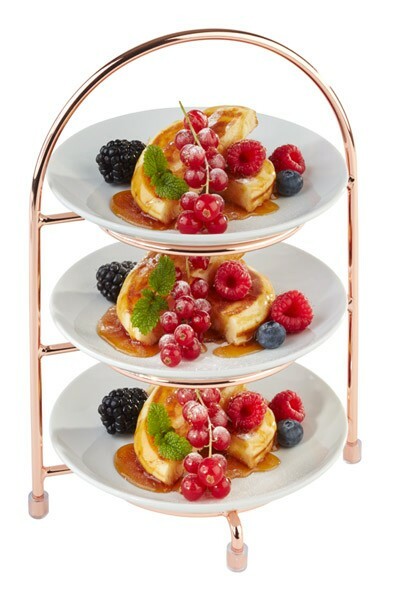 This Copper 3 Tier Cake Plate Stand is perfect for serving afternoon tea, suitable for a range of sandwiches and cakes. Plates not included, but will fit plates up to 17cm in diameter. Looking to buy some Cake Stands & Boards? If you would like some advice on purchasing Cake Stands & Boards, simply contact our expert sales team, giving us either an email or phone number on which to contact you and we'll get back to you with the best advice or contact us by email: [email protected] Phone: 020 8424 8886.